This entry was posted in Events and tagged David McCullough, history, lecture on September 30, 2013 by Wire Eagle. 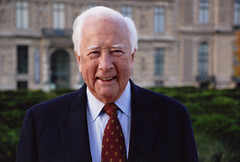 AUBURN UNIVERSITY – David McCullough, acclaimed writer and historian, will discuss the critical role of history in education, life and citizenship, particularly for young people, in a free, public lecture at Auburn University on Tuesday, Oct. 15, at 11 a.m. in Auburn Arena. McCullough, a 2006 winner of the Presidential Medal of Freedom and recipient of two Pulitzer Prizes and two National Book Awards, has been called the master of American history and a “matchless writer.” His books, 10 to date, range from biographies of Harry Truman and John Adams to histories of the Johnstown flood, the Panama Canal and the Brooklyn Bridge. His “1776,” which covers a year in the life of George Washington and the American Revolution, is a classic.